This is a list of areas of chaos terrain officially named by the International Astronomical Union on the planet Mars. Chaos terrain (or chaotic terrain) is an astrogeological term used to denote planetary surface areas where features such as ridges, cracks, and plains appear jumbled and enmeshed with one another. Coordinates are in planetocentric latitude with east longitude. Areas of chaos terrain are usually named after a nearby albedo feature as in line with the IAU's rules on planetary nomenclature. Such an albedo feature must feature on the maps of Mars made by either Giovanni Schiaparelli or Eugène Michel Antoniadi and are listed at Classical albedo features on Mars. In this mosaic taken by the Mars Global Surveyor, Aram Chaos lies in the upper left and Iani Chaos in the lower right. Wikimedia Commons has media related to Chaotic terrains on Mars. This list was adapted from the public domain Gazetteer of Planetary Nomenclature, courtesy of the United States Geological Survey. The Arcadia quadrangle is one of a series of 30 quadrangle maps of Mars used by the United States Geological Survey Astrogeology Research Program. The quadrangle is located in the portion of Mars’ western hemisphere and covers 240° to 300° east longitude. The quadrangle uses a Lambert conformal conic projection at a scale of 1,5,000,000. The Arcadia quadrangle is referred to as MC-3, the southern and northern borders of the Arcadia quadrangle are approximately 3,065 km and 1,500 km wide, respectively. The north to south distance is about 2,050 km, the quadrangle covers an approximate area of 4.9 million square km, or a little over 3% of Mars’ surface area. The region called Tempe Terra is in the Arcadia quadrangle, several features found in this quadrangle are interesting, especially gullies which are believed to be caused by relatively recent flows of liquid water. Dark slope streaks and dust devil tracks can have a striking appearance, Arcadia is the name of a telescopic albedo feature located at 45° north latitude and 260° east longitude on Mars. The feature was named after a region in southern Greece. The name was approved by the International Astronomical Union in 1958, the quadrangle contains Alba Patera, the largest volcano in the solar system and Tempe Terra, a highly fractured block of ancient crust about the size of Alaska. Large troughs are called fossae in the language used for Mars. This term is derived from Latin, therefore fossa is singular and these troughs form when the crust is stretched until it breaks. The stretching can be due to the weight of a nearby volcano. Fossae/pit craters are common near volcanoes in the Tharsis and Elysium system of volcanoes, a trough often has two breaks with a middle section moving down, leaving steep cliffs along the sides, such a trough is called a graben. Lake George, in northern New York State, is a lake that sits in a graben, pit craters are often associated with graben. Pit craters do not have rims or ejecta around them, like impact craters do, studies have found that on Mars a fault may be as deep as 5 km, that is the break in the rock goes down to 5 km. Due to the types of investigations involved, it is closely linked with Earth-based geology. 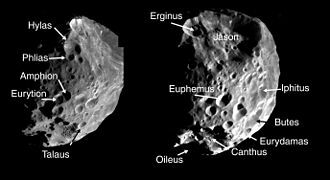 The structures of the giant planets and their moons are examined, as is the make-up of the bodies of the Solar System, such as asteroids, the Kuiper Belt. He made important contributions to the field and the study of impact craters, asteroids, today many institutions are concerned with the study and communication of planetary sciences and planetary geology. The Visitor Center at Barringer Meteor Crater near Winslow, Arizona includes a Museum of planetary geology, the Geological Society of Americas Planetary Geology Division has been growing and thriving since May 1981 and has two mottos, One planet just isnt enough. And “The GSA Division with the biggest field area, Planetary geology uses a wide variety of standardised descriptor names for features. All planetary feature names recognised by the International Astronomical Union combine one of names with a possibly unique identifying name. The conventions which decide the more precise name are dependent on which planetary body the feature is on and this means that in some cases names may change as new imagery becomes available, or in other cases widely adopted informal names changed in line with the rules. The Mare Acidalium quadrangle is one of a series of 30 quadrangle maps of Mars used by the United States Geological Survey Astrogeology Research Program. The quadrangle is located in the portion of Mars’ western hemisphere and covers 300° to 360° east longitude. The quadrangle uses a Lambert conformal conic projection at a scale of 1,5,000,000. The Mare Acidalium quadrangle is referred to as MC-4, the southern and northern borders of the quadrangle are approximately 3,065 km and 1,500 km wide, respectively. The north to south distance is about 2,050 km, the quadrangle covers an approximate area of 4.9 million square km, or a little over 3% of Mars’ surface area. Most of the region called Acidalia Planitia is found in Acidalium quadrangle, parts of Tempe Terra, Arabia Terra, and Chryse Planitia are in this quadrangle. This area contains many bright spots on a background that may be mud volcanoes. There are some gullies that are believed to have formed by recent flows of liquid water. Mare Acidalium is the name of a telescopic albedo feature located at 45° N, the feature was named for a well or fountain in Boeotia, Greece. According to classical tradition, it is a location where Venus, the name was approved by the International Astronomical Union in 1958. The quadrangle contains many interesting features, including gullies and possible shorelines of an ancient northern ocean, the boundary between the southern highlands and the northern lowlands lies in Mare Acidalium. The Face on Mars, of great interest to the public, is located near 40.8 degrees north and 9.6 degrees west. When Mars Global Surveyor examined it with high resolution, the turned out to just be an eroded mesa. Mare Acidalium contains the Kasei Valles system of canyons and this huge system is 300 miles wide in some places—Earths Grand Canyon is only 18 miles wide. The HiRISE image below of Acidalia Colles shows gullies in the northern hemisphere, gullies occur on steep slopes, especially craters. Gullies are believed to be relatively young because they have few, if any craters, each gully has an alcove and apron. Although many ideas have been put forward to them, the most popular involve liquid water either coming from an aquifer or left over from old glaciers. Terra Sabaea is a large area on Mars. Its coordinates are 2°N 42°E and it covers 4,700 kilometres at its broadest extent and it was named in 1979 after a classic albedo feature on the planet. Terra Sabaea is fairly large and parts of it are found in five quadrangles, Arabia quadrangle, Syrtis Major quadrangle, Iapygia quadrangle, Ismenius Lacus quadrangle, some landscapes look just like glaciers moving out of mountain valleys on Earth. Some have an appearance, looking like a glacier after almost all the ice has disappeared. What is left are the moraines—the dirt and debris carried by the glacier, the center is hollowed out because the ice is mostly gone. These supposed alpine glaciers have been called glacier-like forms or glacier-like flows, glacier-like forms are a and maybe more accurate term because we cannot be sure the structure is currently moving. Another, more general term sometimes seen in the literature is viscous flow features, a variety of other features on the surface have been interpreted as directly linked to flowing ice, such as fretted terrain, lineated valley fill, concentric crater fill, and arcuate ridges. A variety of surface textures seen in imagery of the midlatitudes, the pictures below show features believed to be glaciers—some may still contain ice, in others the ice has probably largely disappeared. Since ice may be present under just a few meters of debris, when there are perfect conditions for producing sand dunes, steady wind in one direction and just enough sand, a barchan sand dune forms. Barchans have a slope on the wind side and a much steeper slope on the lee side where horns or a notch often forms. The whole dune may appear to move with the wind, observing dunes on Mars can tell us how strong the winds are, as well as their direction. If pictures are taken at intervals, one may see changes in the dunes or possibly in ripples on the dune’s surface. On Mars dunes are often dark in color because they were formed from the common, in the dry environment, dark minerals in basalt, like olivine and pyroxene, do not break down as they do on Earth. Although rare, some dark sand is found on Hawaii which has many volcanoes discharging basalt, barchan is a Russian term because this type of dune was first seen in the desert regions of Turkistan. Some of the wind on Mars is created when the dry ice at the poles is heated in the spring, at that time, the solid carbon dioxide sublimates or changes directly to a gas and rushes away at high speeds. The Mare Australe quadrangle is one of a series of 30 quadrangle maps of Mars used by the United States Geological Survey Astrogeology Research Program. The Mare Australe quadrangle is referred to as MC-30, the quadrangle covers all the area of Mars south of 65°, including the South polar ice cap, and its surrounding area. The quadrangles name derives from a name for a feature that is now called Planum Australe. The Mars polar lander crash landed in this region, around the southern ice cap is a surface, called the Dorsa Argentea Formation that may be an old ice-rich deposit. It contains a group of sinuous, branched ridges that resembles eskers that form when streams are under glaciers, the formation often contains pits, two major locations are named Cavi Angusti and Cavi Sisyphi. The pits have steep sides and an irregular shape and they are up to 50 km across and 1 km deep. The quadrangle contains Angustus Labyrinthus, a formation of intersecting valley or ridges, researchers were surprised to see parts of the surface having a Swiss-cheese appearance. Also, some areas showed strange spider-shaped forms, which were determined to be caused by carbon dioxide gas blowing dust around at certain times of the year, some craters in Mare Australe show gullies. Martian gullies are small, incised networks of channels and their associated downslope sediment deposits. They are named for their resemblance to terrestrial gullies, first discovered on images from Mars Global Surveyor, they occur on steep slopes, especially on the walls of craters. Usually, each gully has an alcove at its head, a fan-shaped apron at its base. They are believed to be relatively young because they have few, a subclass of gullies is found cut into the faces of sand dunes which themselves considered to be quite young. However, this remains a topic of active research, as soon as gullies were discovered, researchers began to image many gullies over and over, looking for possible changes. By 2006, some changes were found, with further analysis it was determined that the changes could have occurred by dry granular flows rather than being driven by flowing water. The Arabia quadrangle is one of a series of 30 quadrangle maps of Mars used by the United States Geological Survey Astrogeology Research Program. The Arabia quadrangle is referred to as MC-12, the quadrangle contains part of the classic area of Mars known as Arabia. It contains a part of Terra Sabaea and a part of Meridiani Planum. It lies on the boundary between the northern plains and the old southern highlands. The quadrangle covers the area from 315° to 360° west longitude, the surface of the Arabia quadrangle appears to be very old because it has a high density of craters, but it is not near as high in elevation as typical old surfaces. On Mars the oldest areas contain the most craters, the oldest period is called Noachian after the quadrangle Noachis, the Arabia area contains many buttes and ridges. Some believe that during certain climate changes an ice-dust layer was deposited, some outflow channels are found in Arabia, namely Naktong Vallis, Locras Valles, Indus Vallis, Scamander Vallis, and Cusus Valles. Many places in Arabia are shaped into layers, the layers can be a few meters thick or tens of meters thick. On Earth, similar changes of climate results in ice-age cycles, a recent study of layers in craters in western Arabia revealed much about the history of the layers. Although the craters in this study are just outside the boundary for the Arabia quadrangle the findings would probably apply to the Arabia quadrangle as well, the thickness of each layer may average less than 4 meters in one crater, but 20 meters in another. The pattern of layers measured in Becquerel crater, suggests that each layer was formed over a period of about 100,000 years, every 10 layers were bundled together into larger units. The 10-layer pattern is repeated at least 10 times, so every 10-layer pattern took one-million years to form. The tilt of the Earths axis changes by only a more than 2 degrees. In contrast Marss tilt varies by tens of degrees, when the tilt is low, the poles are the coldest places on the planet, while the equator is the warmest—as on Earth. The Amazonis quadrangle is one of a series of 30 quadrangle maps of Mars used by the United States Geological Survey Astrogeology Research Program. The Amazonis quadrangle is referred to as MC-8, the quadrangle covers the area from 135° to 180° west longitude and 0° to 30° north latitude on Mars. The Amazonis quadrangle contains the region called Amazonis Planitia and this area is considered to be among the youngest parts of Mars because it has a very low density of craters. The Amazonia period is named after this area and this quadrangle contains special, unusual features called the Medusae Fossae Formation and Sulci. The Amazonis quadrangle is of great interest to scientists because it contains a big part of a formation and it is a soft, easily eroded deposit that extends for nearly 1,000 km along the equator of Mars. The surface of the formation has been eroded by the wind into a series of ridges called yardangs. These ridges generally point in direction of the winds that carved them. The easily eroded nature of the Medusae Fossae Formation suggests that it is composed of weakly cemented particles, another evidence for a fine-grained composition is that the area gives almost no radar return. For this reason it has called a stealth region. Layers are seen in parts of the formation, images from spacecraft show that they have different degrees of hardness probably because of significant variations in the physical properties, particle size, and/or cementation. 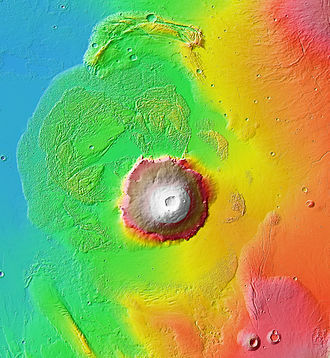 Very few impact craters are visible throughout the area so the surface is relatively young, a very rugged terrain extends from the base of Olympus Mons. Sulci is a Latin term that refers to the furrows on the surface of a brain, the furrows are huge—up to a full kilometer deep. It would be difficult to walk across it or to land a space ship there. A picture of this area is shown below, lava flows sometimes cool to form large groups of more-or-less equally sized columns. The resolution of the HiRISE images is such that the columns were found in locations in 2009. Impact craters generally have a rim with ejecta around them, in contrast volcanic craters usually do not have a rim or ejecta deposits, as craters get larger they usually have a central peak. Abalos Undae dunes at Abalos Scopuli, the scarp of Abalos Mensa. The ice layers on the cap and basal formations are also visible. 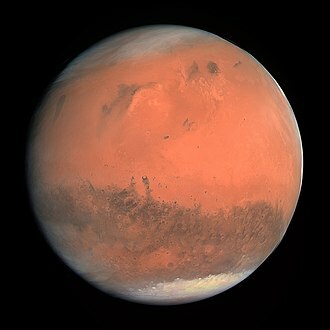 The picture was taken by the HiRISE camera on board the Mars Reconnaissance Orbiter and was enhanced by NASA in RGB colour. Olympia Undae is the largest field of sand dunes on the planet Mars. Cross-bedding features in rock "Last Chance"
Image of the Amenthes Quadrangle (MC-14). The southern part includes heavily cratered highlands; the northern part contains Elysium Planitia; and, the eastern half includes Isidis basin. Image of the Arabia Quadrangle (MC-12). The region is dominated with heavily cratered highlands; the northeast part contains Cassini Crater. 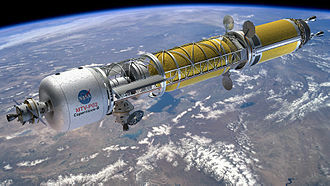 Image of the Arcadia quadrangle (MC-3). The southern part contains the large shield volcano Alba Patera and the highly faulted Tempe Terra province, which includes many small volcanoes. Location of Arcadia quadrangle. The Arcadia quadrangle is in the northcentral part of the Martian northwestern hemisphere, in the northern part of the Tharsis volcanic province. Image of the Argyre Quadrangle (MC-26). The west-central part contains the Argyre basin, defined by a rim of rugged mountain blocks that surrounds a nearly circular expanse of light-colored plains. The large basin is surrounded by heavily cratered highlands. Image of the Casius Quadrangle (MC-6). The southwest area contains Nilosyrtis Mensae (faults, measa and buttes); the rest of the area is mostly smooth plains. Image of the Cebrenia Quadrangle (MC-7). The northwest contains relatively smooth plains; the southeast contains Hecates Tholus (one of three Elysium shield volcanoes) and Phlegra Montes (a ridge system). Bright part is water ice that has been exposed by impact. The ice was identified using CRISM on the MRO. Location is 55.57 north and 150.62 east. Image of the Elysium Quadrangle (MC-15). The north includes relatively smooth lowland plains. Elysium Mons and Albor Tholus are in the northwest and Orcus Patera is in the east. Image of the Eridania Quadrangle (MC-29). The region mainly includes heavily cratered highlands. The west-central part includes Kepler Crater. Image of the Hellas Quadrangle (MC-28). The northwestern part contains the eastern half of Hellas basin. The southwest part includes Amphitrites volcano. The northern part contains Hadriaca Patera. The eastern part is mainly heavily cratered highlands. Image of the Iapygia Quadrangle (MC-21). Most of the region contains heavily cratered and dissected highlands. The west-central part contains Huygens Crater. The southern one-third includes the northern rim of the Hellas basin. Image of the Ismenius Lacus Quadrangle (MC-5). The northern area contains relatively smooth plains; the central area, mesas and buttes; and, the southern area, numerous craters. Image of the Mare Acidalium quadrangle (MC-4). The large craters Lomonosov (far upper right) and Kunowsky (upper right) are easily seen. The famous "face" on Mars is located in the Cydonia Mensae area (bottom right). Image of the Mare Australe Quadrangle (MC-30). The region includes the South Polar ice cap. The central part is mainly a permanent residual ice cap surrounded by layered and troughed terrain which is, in turn, encircled by heavily cratered terrain. MOLA topography of the Thaumasia Plateau (Syria-Thaumasia block) and southern Tharsis. The volcano shown at the left is Arsia Mons. Valles Marineris extends across the northern edge. The areas in brown have the highest elevations on the Tharsis Plateau and may be considered the "summit region" of the Tharsis bulge. Orographic water ice clouds hover over the volcanic peaks of the central Tharsis region in this color image mosaic from Mars Global Surveyor. Olympus Mons dominates at upper left. At center are the three Tharsis Montes: Arsia Mons at bottom, Pavonis Mons at center, and Ascraeus Mons at top.